This style is as popular as ever with young men who like their hair a little longer. It’s easy to cut with a Wahl clipper and it requires very little upkeep. Dampen the hair and comb it down so that it lies straight. Select an attachment guard for your Wahl clipper that will leave the hair long, such as a number 10 or number 12. Start cutting in front of the ear using a rocking, upward motion and work your way around the head, blending sections 1, 2 and 3 as you go. Use the clipper-over-finger technique to cut the hair in section 4 to desired length. Cut the bangs last. Use your clipper with an attachment guard to blend sections 3 and 4. 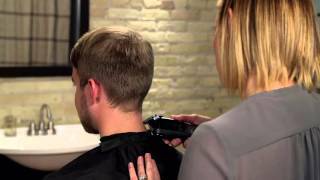 Using the inverted clipper technique or a Wahl trimmer, clean up around the ears and the neckline. The hair on the sides should brush the top of the ears and the hair on the back of the head should be left long. Bangs are long and combed over to the side of the forehead.